Al biclagged [clotted] in clay uncomly cladde […]. The apparition continues to yell and murmur and groan as if it were mad and is shrouded in some sort of unfathomable clothing, covered by toads and circled on all sides by snakes. Gawain finds his courage and, brandishing his sword, demands that the specter give an account of herself. She concedes, saying that she was once a queen—the fairest in the land—and was wealthy and privileged beyond compare, even more so than Guinevere. 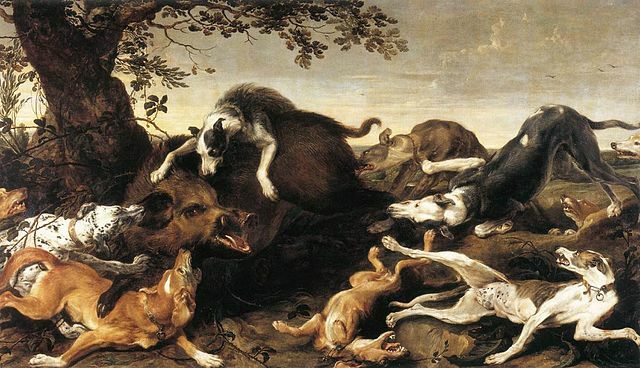 But now she is dead, having lost all—her body a filthy, rotting corpse—and, she says, “God has me geven of his grace / To dre [suffer through] my paynes in this place” (ll. 140-141). 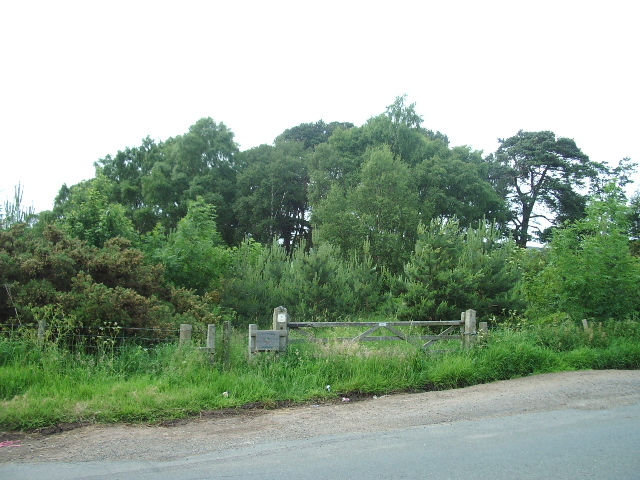 Entrance to the woods surrounding the Tarn Wadling. King Arthur and crew come upon the Tarn Wadling during a hunt in Inglewood Forest. The finery of the court—and especially of Guinevere—is described in several stanzas, much as the ghost describes the splendor she once enjoyed a number of stanzas later. After Gawain talks with her for a bit, she begs to see and speak to Guinevere. We quickly find out why, for she proclaims to Guinevere, “Lo, how delful [doleful] deth has thi dame dight [left]” (l. 160)! 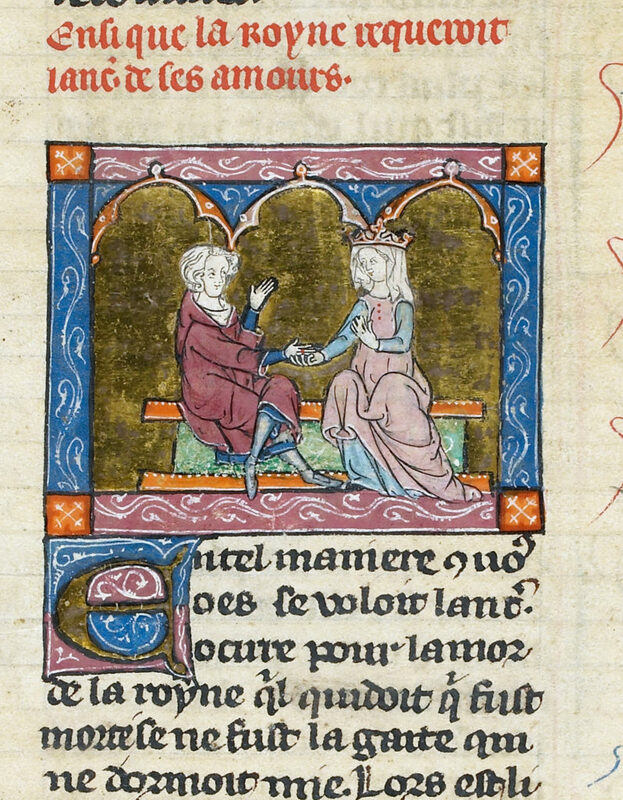 The spirit is her mother, and she urges Guinevere to “Muse on my mirrour” (l. 167). Death will leave her in such a fashion too if she does not give thought to her actions and the afterlife. Arthur and Guinevere. London, British Library, MS Royal 20 D IV, f. 207r. Naxte [nasty] and nedefull, naked on night. In bras and in brymston I bren as a belle [bonfire]. While Guinevere’s mother advocates for compassion and generosity, we discover, however, that it was lust and the breaking of her marriage vows that landed her in torment. These sins bear obvious relation to Guinevere’s own life, and the author doesn’t even feel the need to clarify. Her mother is a mirror. Guinevere and Lancelot. London, British Library, MS Additional 10293, f. 199r. Nonetheless, it is interesting that what this text emphasizes the most is the need for all to have and to practice charity. Sin is bad, of course; and pride is the most hateful fault, as Guinevere’s mother explains. But the Awntyrs is not a treatise on the sins; it is a work that teaches that, of the virtues, “[…] charité is chef [paramount], and then is chaste [chastity], / And then almessedede aure [above] al other thing” (ll. 252-253). The duty of the Christian, according to the author of the Awntyrs, lies in each person’s responsibility towards every other. 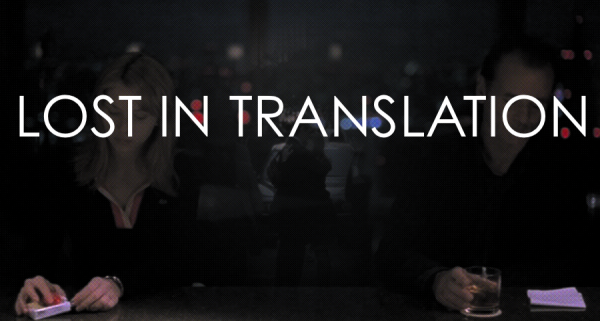 And this extends ad infinitum, for the prayers of those on earth are succor to the dead. The audience learns this because Guinevere promises to provide Masses for her mother’s soul, praying that Christ will bring to bliss she for whom he was crucified, he to whom she was dedicated in Baptism, though her mother stresses again that Guinevere must also provide for those living who lack food. Before Guinevere’s mother departs, Gawain pipes in, having clearly been listening. He asks about those nobles and knights who enter other’s lands in territorial expansion, crushing under their heels the people and seizing the glory and the riches without any right. Now, if anyone is familiar with Gawain, this is rather too self-aware for his character—clearly the author is speaking here. The royal wraith responds by denouncing Arthur as too covetous a king and saying that the court should be wary. The second half of the Awntyrs deals precisely with these problems of excess and conquest, and I leave this part of the plot for readers to explore on their own. Concerning the fifteenth-century text that has reached us, it is preserved in four manuscripts: Oxford, Bodleian Library, MS Douce 324; London, Lambeth Palace Library, MS 491.B; Lincoln, Lincoln Cathedral Library, MS 91 (Thornton Manuscript); and Princeton, Princeton University Library, MS Taylor 9 (Ireland Blackburn Manuscript). The beginning of The Awntyrs off Arthure.f. 1r of Oxford, Bodleian Library, MS Douce 324 (c. 1450-1475). Photo: © Bodleian Libraries, University of Oxford. The underlying dialect in the manuscripts is northern, being locatable most likely to the historic county of Cumberland (now part of Cumbria), which is also where the action of the narrative takes place. The work is extremely ornate, making use of both alliteration and rhyme. And as the text’s editor, Thomas Hahn, also notes, given the themes, it is quite probable that the author was a cleric, possibly residing in Carlisle. The Latin exempla tradition most certainly influenced the text, but the genius of the author was to weave his moral teaching into an exciting Arthurian tale, sweetening the medicine, as it were, with a captivating literary exterior. Be this as it may, the Tarn Wadling has always been eerie, emitting strange sounds and even once having an island appear and then disappear. It is hard to say whether it was due to a desire to bring an end to the place and quash superstitions or increase his arable land and acreage that Lord Lonsdale ordered the lake to be drained and filled in sometime during the nineteenth century. Sadly, the tarn itself is no more, but the stories persist—as perhaps do the spirits. The edition used is the following: “The Awntyrs off Arthur.” Sir Gawain: Eleven Romances and Tales. Ed. Thomas Hahn. Kalamazoo: Medieval Institute Publications, 1995. 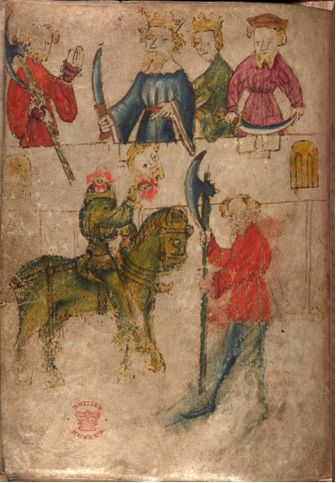 This can be found online here: http://d.lib.rochester.edu/teams/text/hahn-sir-gawain-awntyrs-off-arthur. 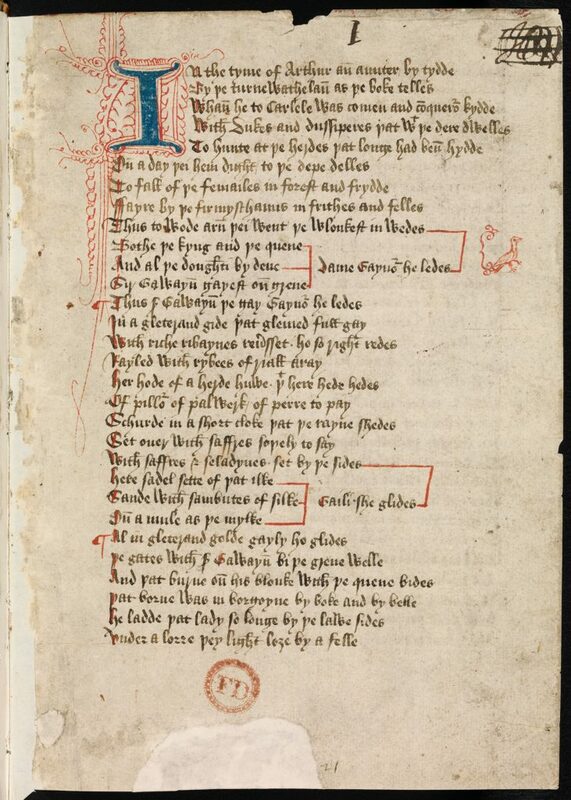 And here is an introduction: http://d.lib.rochester.edu/teams/text/hahn-sir-gawain-awyntyrs-off-arthur-introduction. You can find information about the location here: https://www.woodlandtrust.org.uk/visiting-woods/wood/4726/tarn-wadling/. See the entry “tarn” in the Oxford English Dictionary as well as “terne” in the Middle English Dictionary. 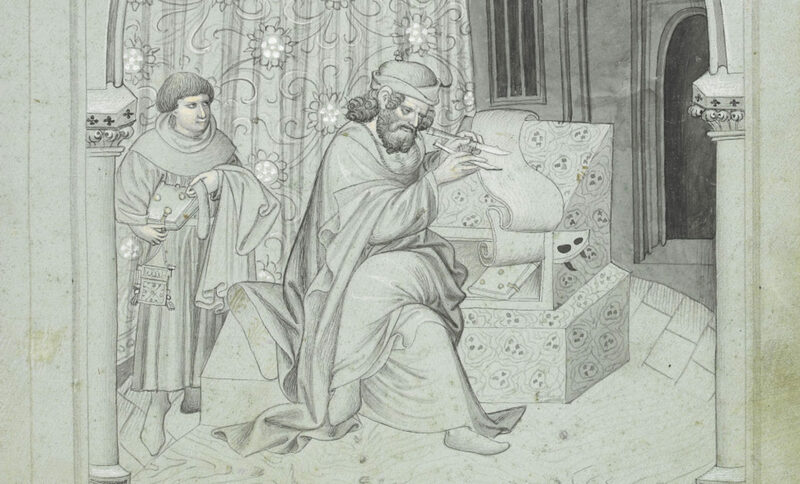 The entire manuscript is digitized here: http://www.bl.uk/manuscripts/FullDisplay.aspx?ref=Royal_MS_20_d_iv. Dated c. 1300-1380, it contains part of the Lancelot of the Vulgate Cycle. 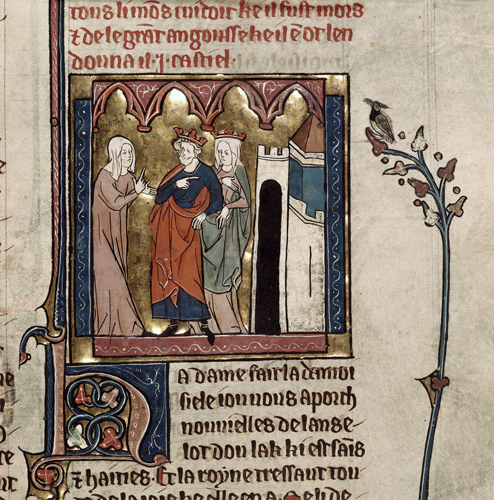 The image shows Arthur and Guinevere receiving news from a damsel. See the catalogue description with some images here: https://www.bl.uk/catalogues/illuminatedmanuscripts/record.asp?MSID=18463&CollID=27&NStart=10293. This manuscript contains another copy of the Lancelot, c. 1316. See images here: https://digital.bodleian.ox.ac.uk/inquire/Discover/Search/#/?p=c+0,t+,rsrs+0,rsps+10,fa+,so+ox%3Asort%5Easc,scids+,pid+f03eea52-0af3-4ff7-9069-c41a4b2f6c6b,vi+6e581efc-2391-4258-b621-0f85fe45f40f. You can find more information here: http://medievalromance.bodleian.ox.ac.uk/A_ghostly_encounter. On this, see especially David N. Klausner’s “Exempla and The Awntyrs of Arthure.” Medieval Studies 34 (1972): 307-25. Thomas Hahn provides further reading, editions with introductory material as well as scholarly articles, at the end of his introduction (see note 1). For more on the history of the Tarn Wadling, go here: https://www.cumbriacountyhistory.org.uk/tarn-wadling-background.